The Honda Pilot in its current form debuted for the 2016 model-year. For its fourth go-around the SUV gets a number of revisions to keep it fresh for battle in its segment. For the moment, the announced changes concern the American edition, but we can be pretty confident that the essentials will be the same for the model Canadian consumers buy later this year. First and foremost are the changes affecting the SUV’s styling. The front end gets a new, more-aggressive fascia that includes a bumper integrating larger openings for the anti-fog lights. The front grille also gets some light retouches, and the upper chromed band now extends above the light clusters. In back, the design of the lights has been modified, while chrome accents have been added to the mix. The alloy wheels have been given new styling as well. In terms of tech, the Pilot has been updated with the availability of a new touchscreen incorporating new technologies, including Apple CarPlay and Android Auto compatibility. And lo and behold, a knob has been brought back for the volume of the audio system. This is no joke; the automaker took such a beating from users regarding its absence, we’re seeing it reappear in model after model that gets renewed. 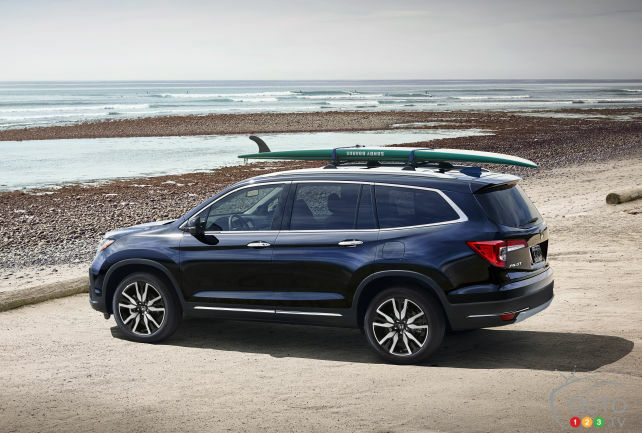 The other significant addition has to with safety; the Honda Sensing package is now part of the standard equipment in all iterations of the Pilot.